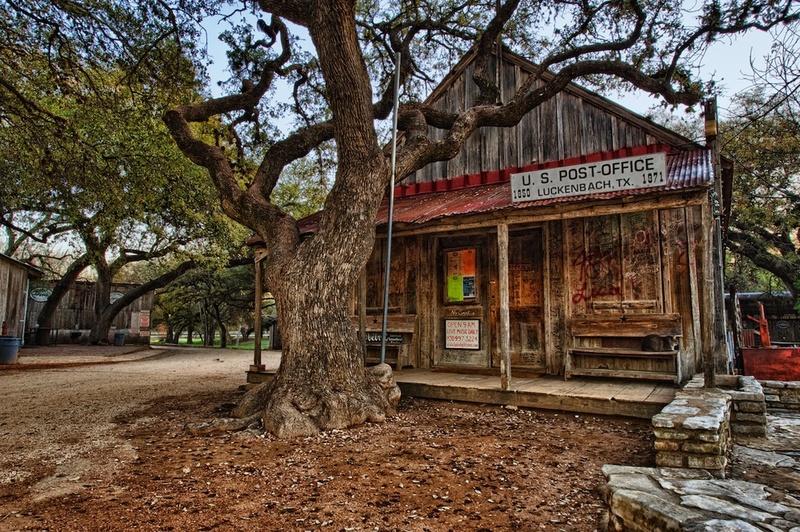 Good old Luckenbach, TX. This is some town. Well, it's not really a town, I guess. It's an unincorporated community in the Texas hill country about 70 miles west of Austin. But it's awesome. It's only about 9 acres in size - which is tiny - but it's got a lot of character. Since the 1970's it's been "famous" as a country music mecca with performances from greats such as Waylon Jennings, Willie Nelson, and Lyle Lovett. And really, there are only 2 main buildings there - the dance hall and this building, which is a combination Post Office/General Store/Saloon. I went there at sunrise one morning, because I knew that was my best chance to shoot it empty (which I love to do). It feels like a ghost town and doubly so when it's just me, my Nikon, two cats and a handful of squawking chickens walking around. It was pretty dang fun, really.